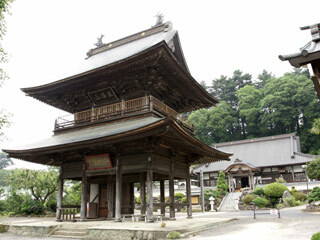 Chofukuji Temple (東勝山長福寺) was built at 1029 by Baikanrishi by enshrining Buddha at Mt. Chofuku. It has a great gate which you can enter to 2nd floor. Not many temple allow people to enter the gate. This temple is also one of the 100 Eastern Temples of Flower. You can enjoy flower for each season. Enter fee for the gate: 200 yen. For Flower garden: 300 yen. Chofukuji temple was built at 1029 by Baikanrishi. Not like other style of Buddhism which focus "Zen" sprits, this temple was based on Risso style up until1984. In 1469, one of the land master, Yoshifusa Ogawa, became a believer and he help to develop this temple. However, because the access condition was not good, he moved the main temple in their castle at 1470. It backed at the original place at 1506 because the castle was not pertinence place for Buddhism. After several change of the owner and style for hundreds of years, former resident priest spent his entire career to fix and renewal the temple. Currently, it is very beautiful temple with the great gate and flower garden. This temple is also 51st temple of the eastern temples of flower.